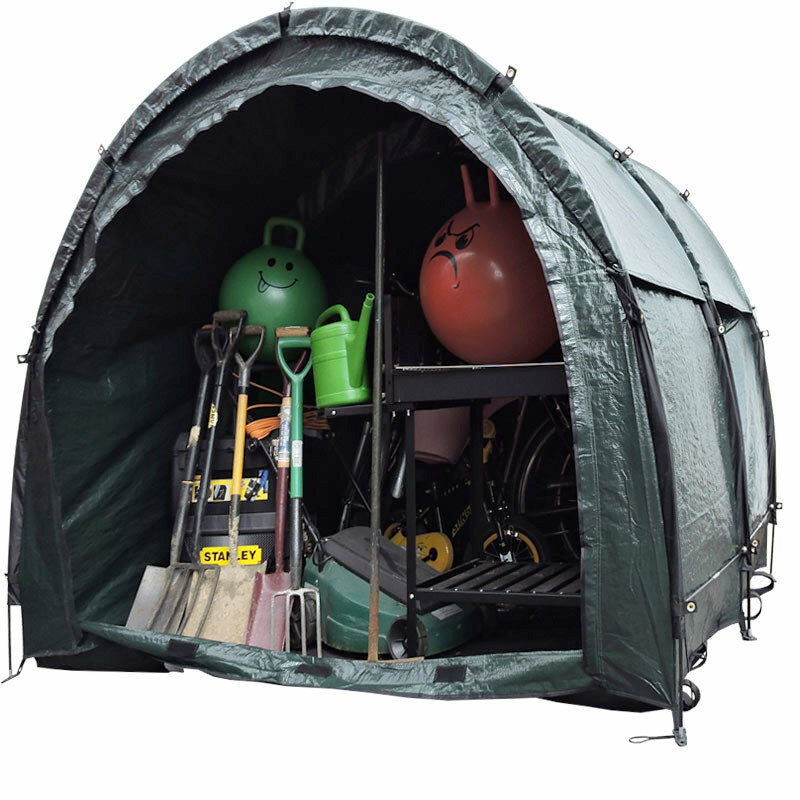 All new TidyTent Xtra brings you a new dimension to outdoor storage. 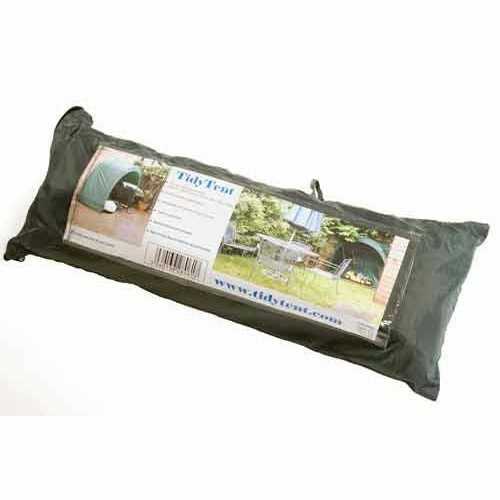 This is the modular, zip-together, extendable version of the Tidy Tent. MMSS – consider TidyTent as a Mini Modular Shed System. 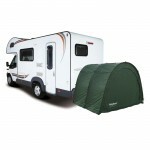 Is a single TidyTent (Bike Cave/Campa Cave) not big enough for you? No problem. 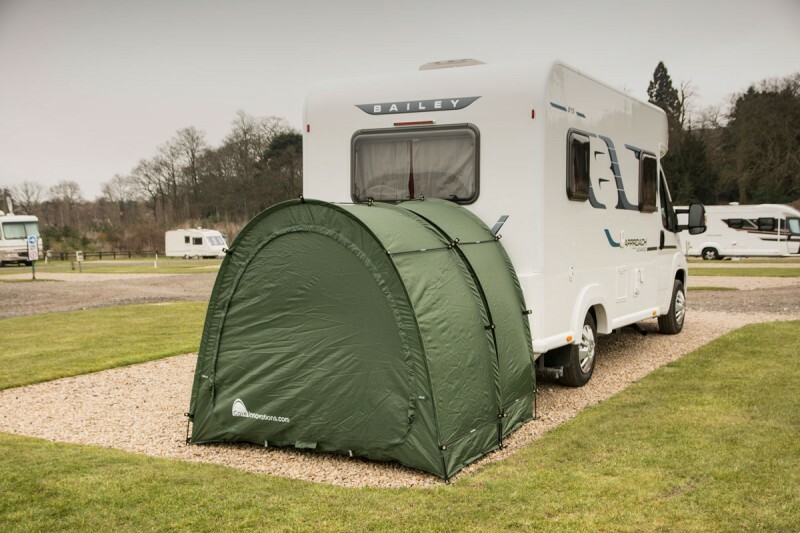 With the TidyTent Xtra you can extend your storage space to suit your needs. 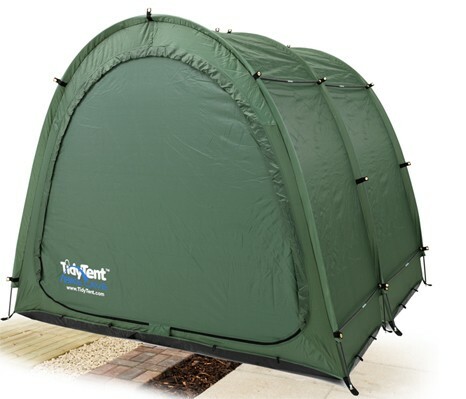 TidyTent XTRA – how does it work? 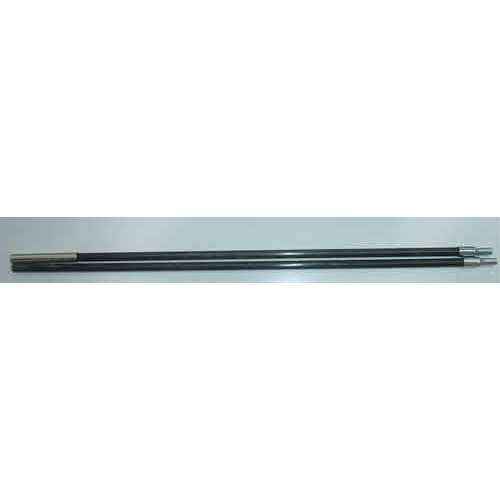 Another benefit with the TTX… in the pack you will find an additional pair of vertical fibreglass poles. 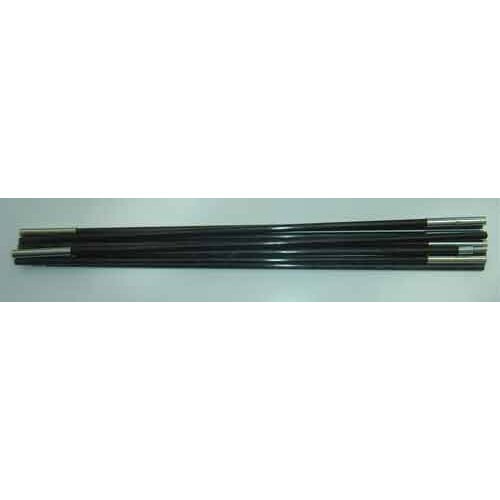 These are optional, designed to fit vertically under the two main arched poles to afford additional strength and support in the event of snow. 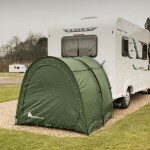 The new TidyTent Xtra will attach to the front of your existing standard TidyTent to extend and increase its capacity. It also works as a modular outdoor storage solution for your caravan or campervan / motorhome (that’s a trailer or RV if you’re from the US!). Check out this funky video – those TidyTents are popping up everywhere! Thousands of happy customers attest to Tidy Tent XTRA being a great low cost and versatile solution to the problem of outdoor storage. Made from a tough, hardwearing and durable PE polyethylene fabric, the design includes a protective flap over the zip to limit water ingress. Every attempt is made to ensure they are as watertight as possible but there is no absolute guarantee that they are 100% waterproof. Like any tent, depending on the extent of inclement weather, a small amount of rain water ingress or condensation can occur. 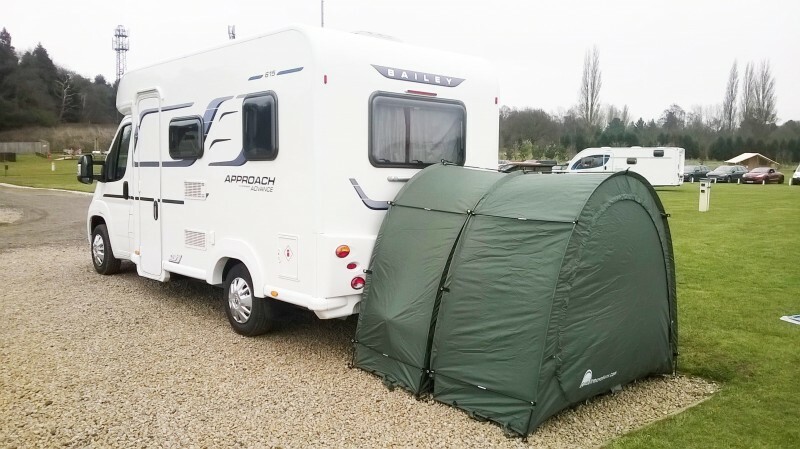 The mesh groundsheet is designed to improve air flow, reduce condensation and allow any water ingress to escape quickly and effectively. Please note that over time the fabric may fade and degrade in sunlight. The newest model is now supplied with a replaceable roof hood. This extends the longevity of the product by improving not only waterproofness but also UV protection. When eventually after several years the fabric starts to degrade, rather than having to replace the whole cover, you can now simply purchase a new roof hood! 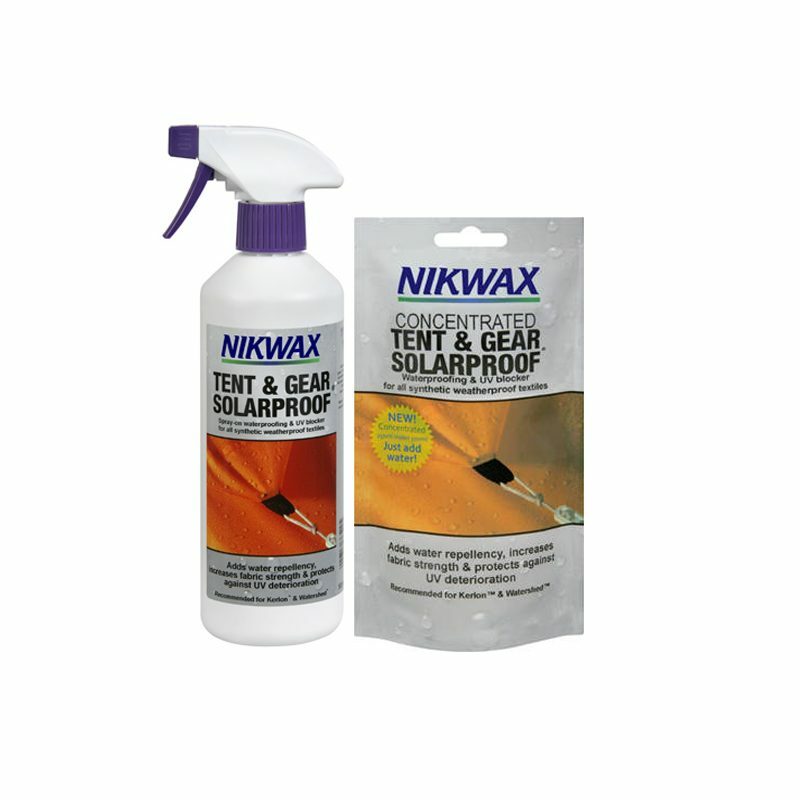 For our older pre-September 2018 models, we strongly recommend Nikwax Tent & Gear Solarproof/Water proofer. One spray can double the effective life of fabric and make it more durable, and is suitable for a variety of products and appliances. Click here for more details. Note, however, Nikwax is not required for the newest PE polyethylene model. The door panels of the Tidy Tent Xtra are attached not with a single zip but with two separate zips, each going half way round. 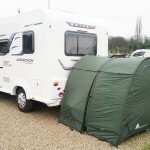 Note that the zips are configured such that one of the zips has the slider attached to the body of the tent and the other has the slider attached to the door panel. The zips on the front aperture are configured in the opposite way to the zips on the rear aperture. In this way, you can detach the front door panel of one unit and the rear door panel of another unit and zip the two units together. 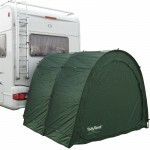 You can zip two, three or more units to extend the size of your TidyTent to suit your needs. Intellectual Property: Tidy Tent, TidyTent, BikeCave, Bike Cave and CampaCave are all registered trade marks. The product is protected by European Community design registration, US & Chinese design patents. All images and text on our websites and advertising media are copyright. This bike tent is impressive and I am very happy to recommend. I live in a house with a small garden and no more space in the shed. Thanks guys – great invention your Bike Cave. Together with the additional TidyTent Xtra I now have space for all 5 of our bikes. A great quality bicycle storage shelter. Really impressed with how easy it was to assemble. Now all our bikes have their own dedicated home. Good quick delivery too. Just to let you know I am very pleased with my TidyTent, I can store everything I need and still with some room to spare! A great product and well worth the money if, like me, you don’t want to go through the trouble of building a shed. I keep my gardening equipment and all my kids’ outdoor toys in there. I still have room for a bike, too! 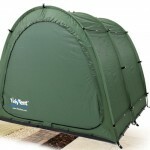 We have bought a couple of these and set them up as an extension to our shed, which is full. We keep the lawnmower and three bikes in them. We also bought the Anka Point security bracket so that we can lock the bikes up. All in all a neat product, a fairly cheap solution to our storage problem. Great design. I’ve just purchased a replacement with the extra module this time. Much stronger material and the extra space is great to store 4 bikes with room to spare. Many thanks!